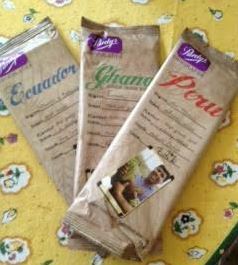 I contacted Purdys to ask them a bit about their single origin bars like why did they decide to do it. What were they hoping to bring to chocolate with their single origins? Why had they chosen those specific origins? They chose not to answer so I’m guessing that these were the beans the broker they were using had available cheaply and they just grabbed them, used someone else’s packaging to design theirs and ran with it. Ghana – not sure about this one. I don’t like the flavour of the bean in the bar. It’s muddling in the milk chocolate from and I’m not sure I like it. The malted milk caramel notes are just not clear in the bar and it’d just not nice to me. If you don’t mind muddled notes, it’s otherwise pleasant enough. You might want to try this bar because my kid brother says the tears of orphans make everything taste sweeter. My kid brother is more cynical then I am. Peru – This is from the San Martino region of Peru. Initially the red fruits come through from the outset and I really like the way the flavour evolved the acidity and red fruits. There is a lot of chocolaty notes in here but I feel like I’m tasting a bit of the packaging in the notes that come through towards the end. I was surprised by the red fruits but disappointed by the almost chemical tasting notes. Out of the factory I’ll bet this tastes amazing which for a Peruvian chocolate was a surprise. 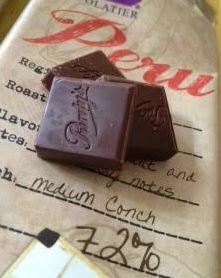 This is more like an Ecuadorian chocolate than the other Peruvian I’ve tried. Overall this is a mixed bag. 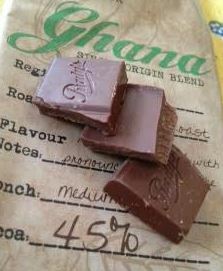 They need to fix the problem with the Ghana to get a decent flavour out of it, get the packaging issue addressed for the Peruvian and maybe re-examine their roast on the Ecuadorian. You can buy this in Purdy’s shops across Canada and probably online. 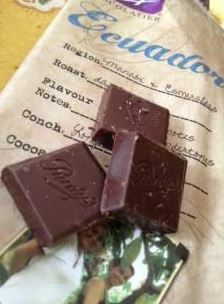 are you not as keen on Peruvian chocolate compared to other origins then?